If we cannot resolve a complaint immediately, because the matter requires further investigation, we will contact you again within 5 working days. If you are not satisfied with our response you may wish to take your complaint to the Fundraising Regulator. CARE also provides an anonymous ethics line which staff and anyone outside the organisation, anywhere in the world, can use to report wrongful conduct. Please click here to go the CARE Line website for more information. Please note the point at which you are experiencing a problem and the error message you are receiving and then contact us at supportercare@careinternational.org. If you prefer, you can complete your donation over the phone – please call your Supporter Care team on 020 7091 6100. You can call Caroline in your Supporter Care team on 020 7091 6100 to set up a regular gift or make a donation over the phone. We do not advise sending cash in the post. You can also donate via our CAF page. How can my company support CARE? There are lots of ways, from setting up a payroll giving scheme, to entering a team in one of our fundraising events or working with us as a corporate partner. Is CARE registered with the Fundraising Regulator? Yes, we are registered with the Fundraising Regulator and abide by its Code of Fundraising Practice and the Rulebooks for Street and Door to Door Fundraising. You can read our fundraising pledge to supporters on our transparency page. In order to save costs we regret we cannot reply to speculative enquiries about jobs. All our vacancies are posted on our jobs page. CARE International is unable to accommodate volunteers looking to travel overseas. If you have medical expertise, please visit www.merlin.org.uk, technical expertise www.redcross.org.uk, or try VSO (Voluntary Services Overseas) www.vso.org.uk. Read more about opportunities to volunteer for CARE in the UK, through our Speaker Network or as an Event Volunteer. We receive a lot of requests for detailed information from students, but regret that because of time constraints we are unable to reply to such queries. We hope you can find useful information on this website and on our policy and research website Insights. 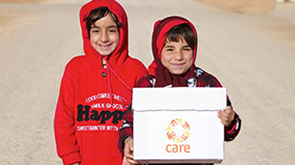 If you would like to find out the contact details for other CARE International Members please visit the CARE International Secretariat website. If you would like to find out the contact details for other CARE offices around the world please visit the CARE International Secretariat website (details are on the individual country pages).